Built by Hendel Homes, this home is a Family Showhouse with charming details throughout the entire home. 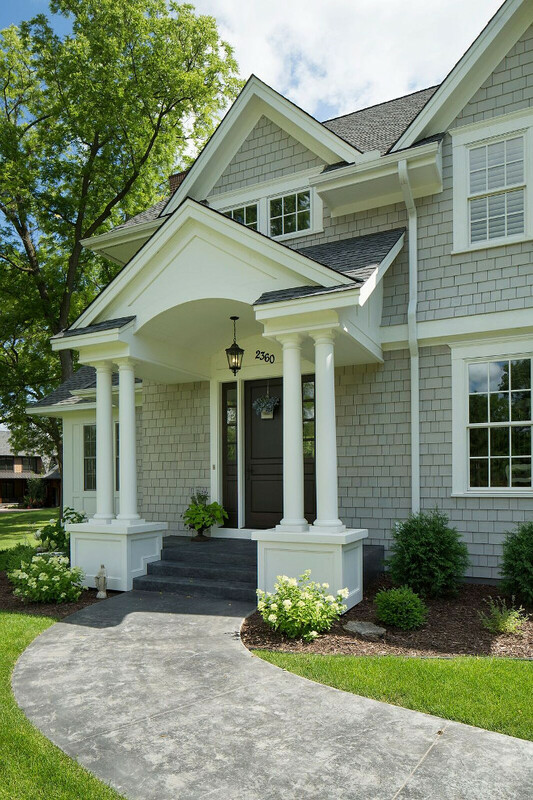 The grey shingle home is set on 5 acres near Lake Minnetonka, MN. The family loved the rolling hills in this area and the easy access to lakes, bike paths, and excellent quality of life. The homeowners, a family of 4 with kids in their early 20’s, wanted a Nantucket inspired home with cottage style where they could entertain and have plenty of space for family gatherings. 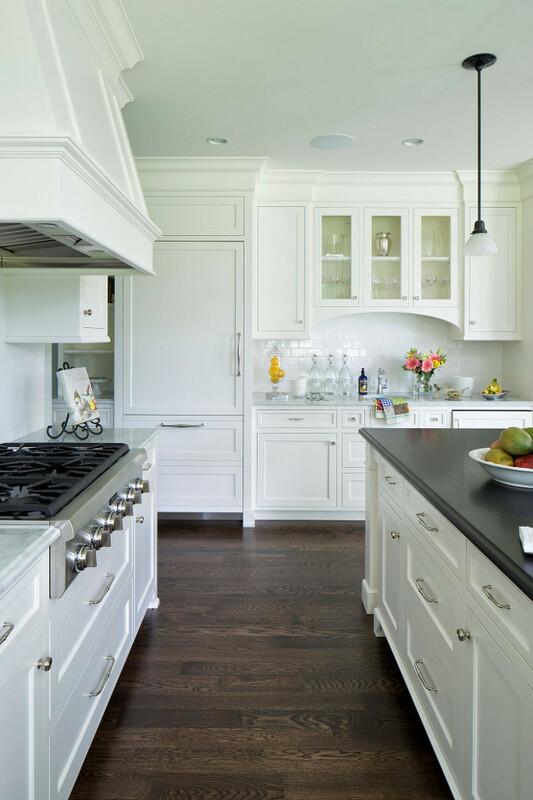 The kitchen in this shingle cottage speaks to the fun, whimsy feel with accents of color against the creamy white cabinets. All in all, this home welcomes everyone who enters and sets a very American family white picket fence flair. 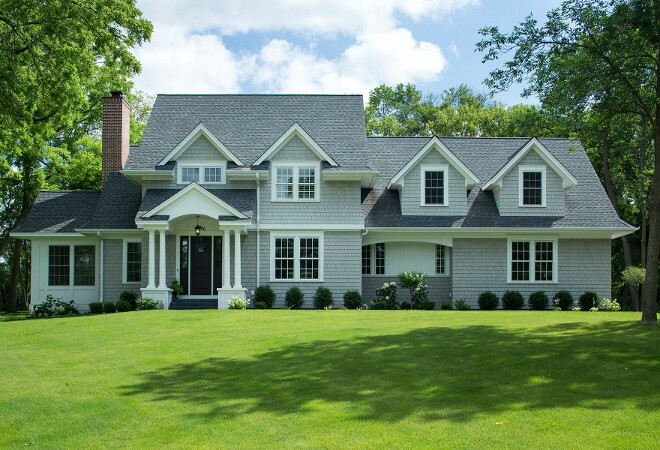 This grey shingle home, painted in Benjamin Moore Thunder, is located on a private lot surrounded by tall trees. The brick used on the chimney is by General Shale. 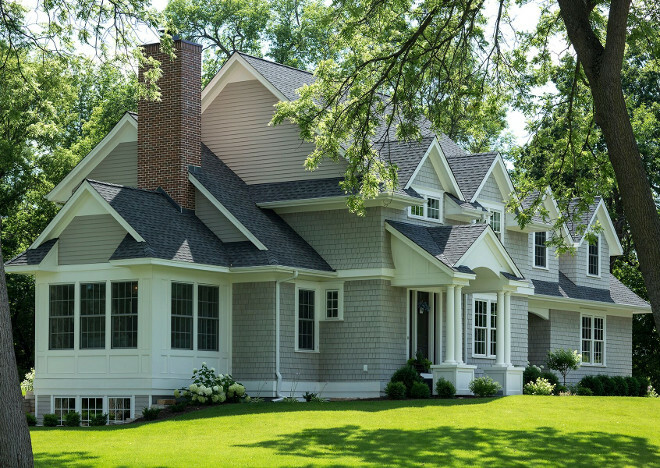 This home features classic, Nantucket-inspired architectural details. 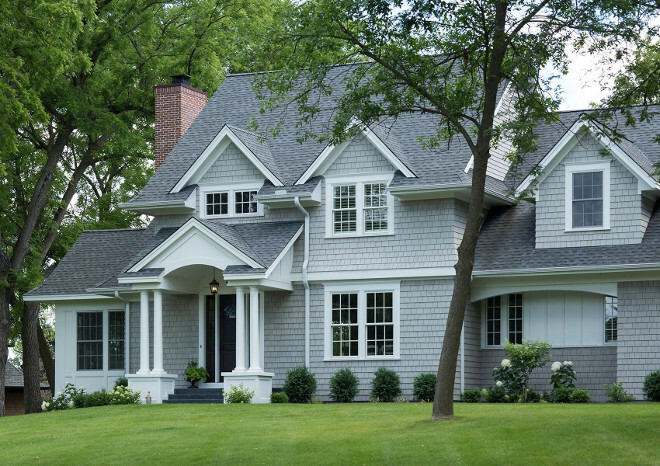 Exterior Trim Paint Color: Benjamin Moore OC 17 White Dove. The dark front door stain is custom. This arched foyer features a built-in bench and a closet. Wall paint color is Benjamin Moore Gray Wisp. Door hardware is from Restoration Hardware. 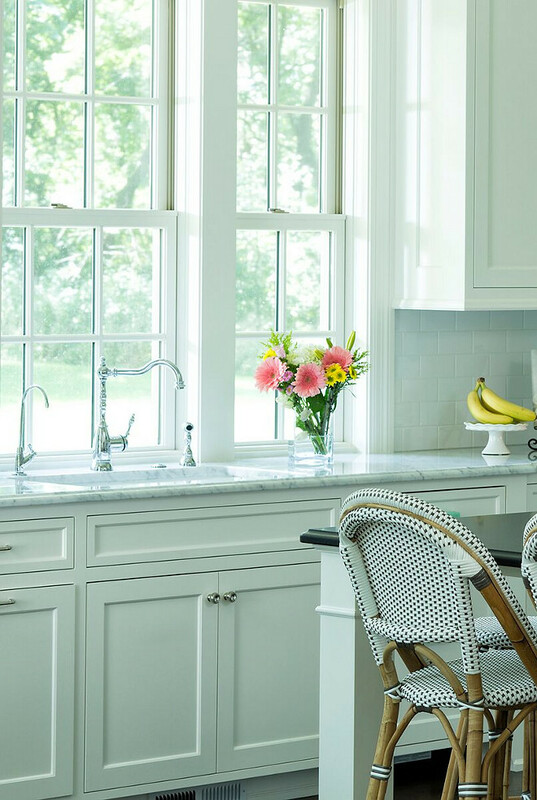 This kitchen is inviting and cheerful. Perimeter countertop is white granite, “Bianco Gioia”. 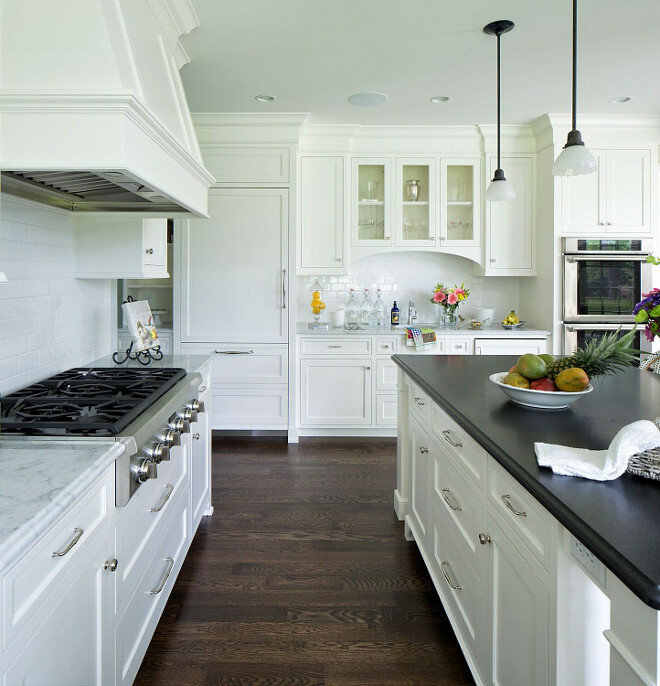 Island countertop is Absolute Black Honed (50″x86″) with Ogee edge. The single control kitchen faucet with side spray in polished chrome was sourced by Pipeline Supply Inc. in Hopkins, MN. 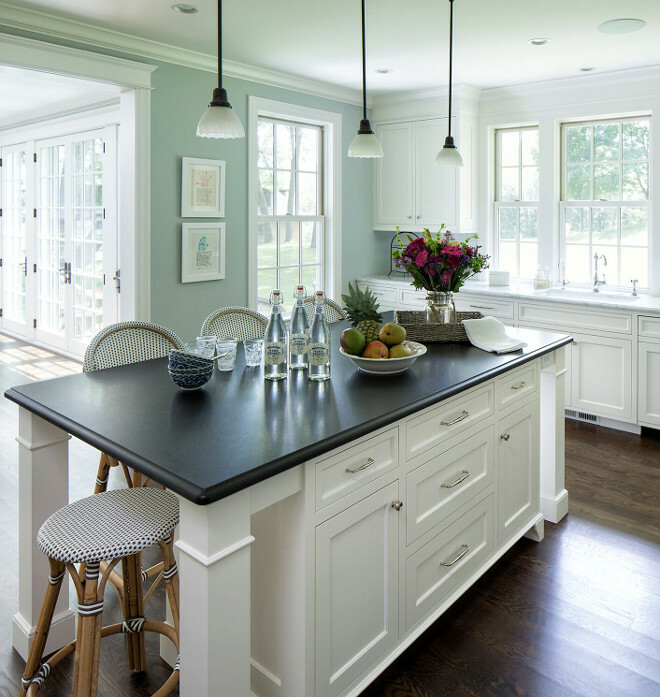 The kitchen cabinets are maple painted in Benjamin Moore Icicle. The kitchen wall paint color is Benjamin Moore Night Mist. Wood flooring is 4” white oak with custom dark stain similar to 50/50 mix of Minwax Ebony and Jacobean. Kitchen hardware is Gilmore from Restoration Hardware. Double Oven and refrigerator are by Thermador. Notice the stunning wet bar cabinet between the oven and the refrigerator. 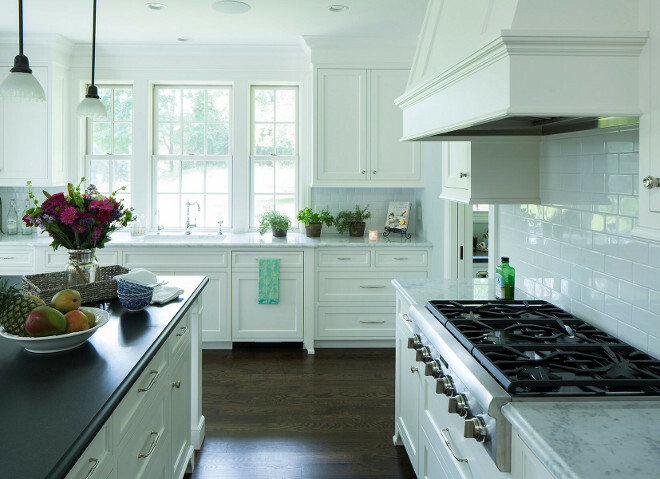 The kitchen white subway backsplash tile is American Olean (AO) 3×6 in Ice White. 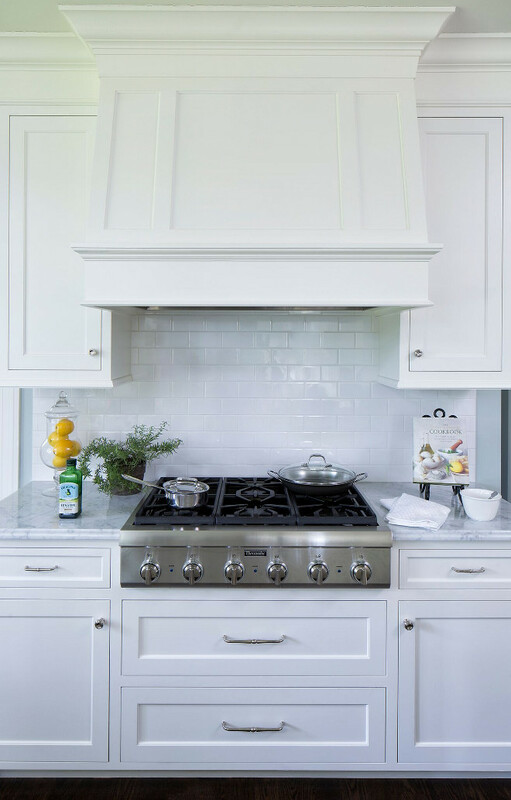 Range top is a 36″ Thermador. 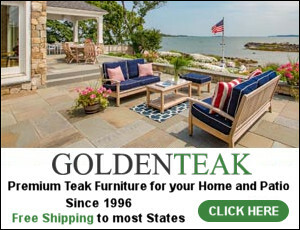 Ceiling paint color is Benjamin Moore White Dove – flat. 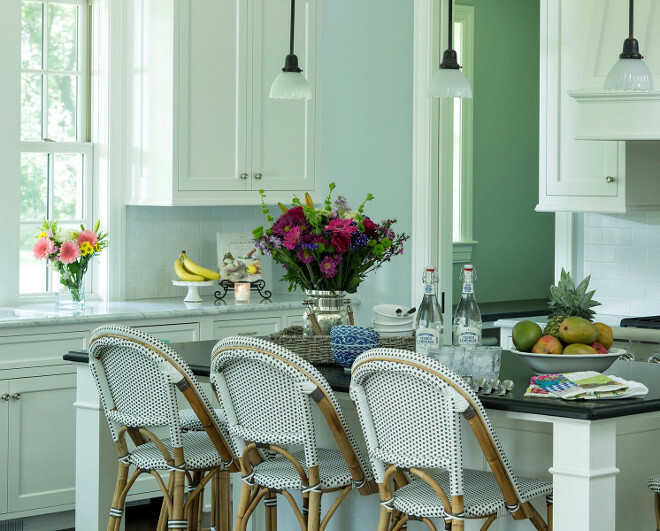 The kitchen bistro-style stools are from Serena & Lily. 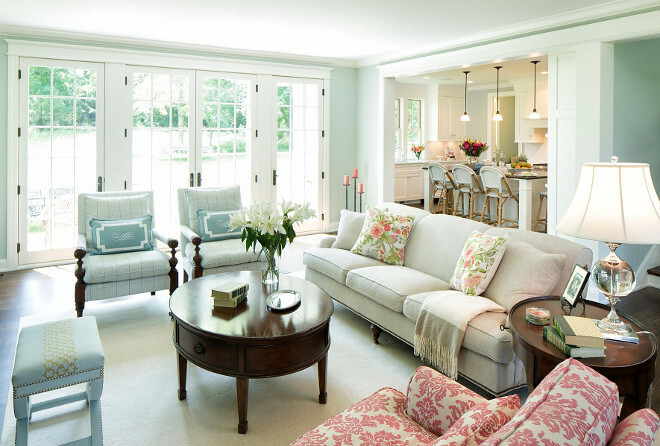 With a more traditional approach, this great room feels elegant yet very inviting. 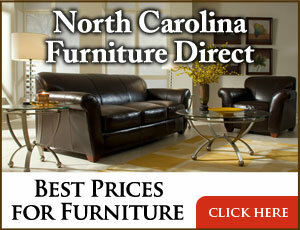 Furniture & Decor: Many pieces are from Grace Hill, Wayzata, MN. 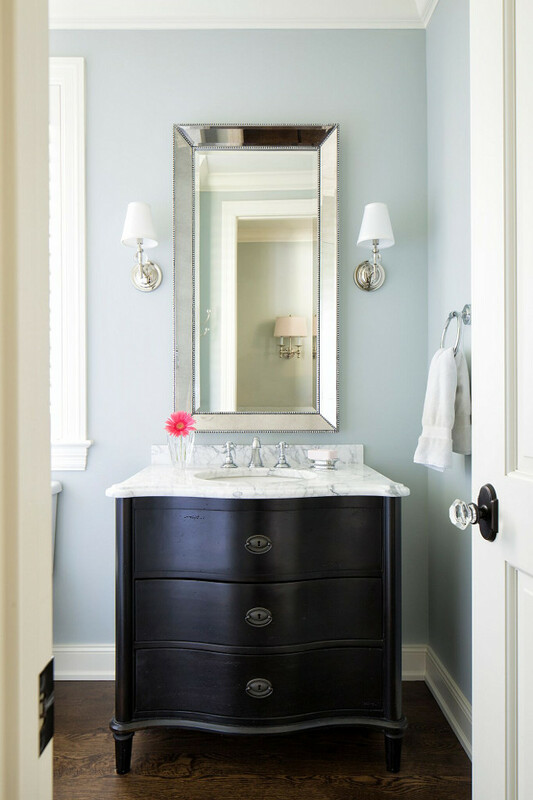 I love this soothing color – Benjamin Moore 1569 Night Mist. The cabinet and trim paint color is Benjamin Moore Icicle in Enamel. Isn’t this sunroom happy and fun? The colors are perfect to kick the wintry blues away! 🙂 The paint color is Benjamin Moore HC-1 Castleton Mist. 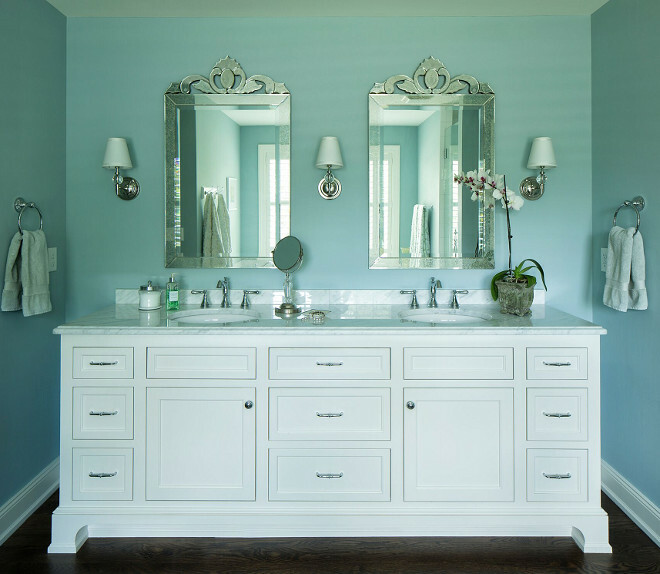 Powder room paint color is Seafoam by Benjamin Moore. The countertop is Venatino Granite. The bathroom paint color is Benjamin Moore 2122-40 Smoke. The master bathroom vanity countertop is “White Carrara” with Ogee edge. Faucet is Delta Cassidy with lever handles in polished chrome. Lighting is from Restoration Hardware. 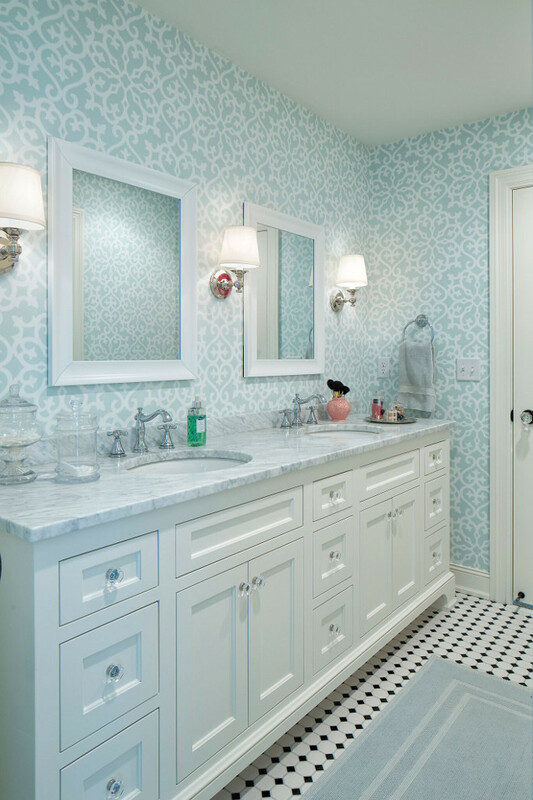 The grandkids’ bathroom is charming and fun. Flooring is 2×2″Oct. White with Black Dot Tile from Home Depot. Sconces are Lugarno from Restoration Hardware. Isn’t this a dream home? Perfectly designed and built! Siding and Trim Paint Color: Siding paint color is Benjamin Moore Thunder. Trim paint color is Benjamin Moore White Dove. 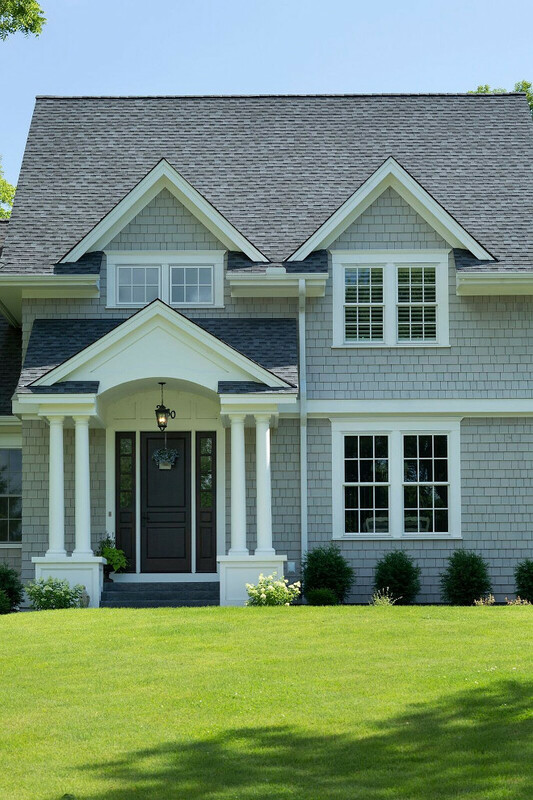 This is a classic exterior paint color combination. Save or pin this. You really can’t go wrong with these colors together. Classic French Lake House Design. Monday: Beautiful Homes of Instagram. For more interiors, see my latest “Interior Design Ideas“. 2016 Farmhouse Fall Decorating Ideas. 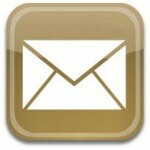 Follow Home Bunch on Pinterest, Facebook and Instagram. Hello, my beautiful friends! How are you doing today? Good, right?! YES!!! We are good, we are healthy, we are in perfect harmony at this moment. Start allowing new, better changes happen in your life from this moment on. Tell yourself you’re open for all of the great things Life can bring to you. You have walked for a long time and you know how deserving you are of being at the top. Believe in yourself, know that you are deserving of love, respect, health and a good life. Start attracting the best for yourself at this moment. No Comments! Be The First!